Villa Infinity is huge, with 8 bedrooms, 8.5 baths, 2 pools with hot tubs, a media/entertainment room, an office, a gym, and so much more. There’s a private 24-hour concierge, a housekeeper, and a laundress. Add a chef for a few dinners for even more pampering, at an additional cost. For the full luxury experience, take a ride in the oversized golf cart to Maundays Beach, where your butler will set up beach chairs, umbrellas, and refreshments for you. Villa Infinity, one of the luxury villas at Sheriva, is a beautiful example of modern architecture and Caribbeanesque influences, with the serenity of understated elegance with contemporary luxuries. The well appointed interiors offer a wonderful haven with a collection of unique art and custom furnishings. 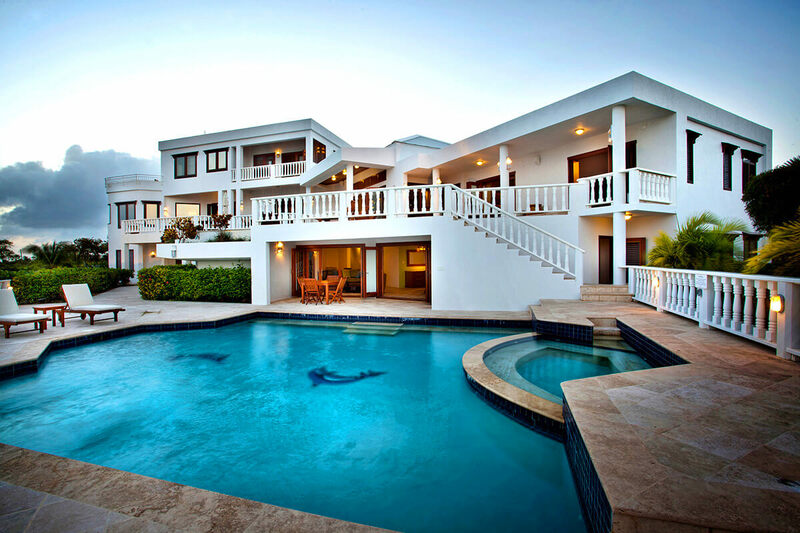 There are great views of neighboring St. Martin and the Caribbean Sea. This regal villa boasts 14,000 luxurious square feet, with 8 exquisite bedrooms, 6 of them ensuites, 8.5 baths, and 2 pools with hot tubs. There are fine finishes of marble, granite and exotic hardwoods with sea grass and banana leaf accents throughout. The furnishings and interior design successfully blend distinctive Caribbean charm with contemporary sophistication. All bedrooms are air-conditioned with ceiling fans and screened doors and most have plasma TVs and DVD players. Enjoy modern comforts such as a central office nook, a well equipped gym, iPod stations, a sprawling media-entertainment room with a 60” plasma TV, a wet bar, a poker table, and card and board games, and magnificent Bose stereo sound—both indoors and poolside. While villa guests enjoy the exclusive use of a road-licensed golf cart, all guests may utilize the complimentary shuttle service to Maundays Bay Beach/Cap Juluca. Tennis and water sports can be arranged through your on-site concierge. Signing privileges are available at Cap Juluca’s restaurants, boutiques, and water sports. The housekeeping staff provides complimentary standard laundry service, pressing service, and nightly turn-down service. There is also nightly security staff on the property. Villa Infinity is a 2 minute golf cart ride from the beach, and less than 5 minutes from the supermarket, grocery store, and health care center. It’s an 8 minute drive to the ferry, and the airport is 15 minutes away. Maundays Bay Beach is a 7 minute walk from Sheriva or 2 minutes by golf cart. Guests are met at the airport or ferry dock by Sheriva staff and shuttled to the villa. Your rental car can be delivered to the villa. Pre-Arrival concierge service, welcome rum/fruit punch and canapes, arrival day pantry stock, one private golf cart for beach-hopping, complimentary beach chairs and umbrellas at Maundays Bay beach, continental breakfast daily, bottled water replenished daily for the duration of guest stay, signing privileges at Cap Juluca's 3 restaurants and 2 boutiques, and use of all villa facilities including office niche with private fax line, WiFi, multiple pool decks. $3 per person/per day tourism marketing levy, daily resort fee of $20 per adult / $15 per child under 12. Car rental, private chef, grocery and beverage shopping (pre-arrival and during your stay), liquor and wine delivery, nanny service, baby equipment, spa services, yoga and personal training, photography, and private airport transfer/car service can be arranged for an additional fee. Good for stays from Jan 18, 2019 to Jun 30, 2019.